We are excited to announce that the collaborative installation Hear, Feel, See What! will be on display until July 31st at Centre! Accessibility information: The piece is installed in our Members’ Gallery on the ground floor for the month of July. This location is wheelchair accessible. View the exhibition information in ASL. Video produced by Deaf Spectrum. Centre for Print and Media Arts in Hamilton and VibraFusionLab in London, Ontario present Hear Feel See What!, a collaborative speculative soundscape and interactive installation. Five artists from Hamilton, London, and Toronto, including hearing, hard of hearing and Deaf artists, and an archivist co-authored a piece that captures and documents both the audio and vibrations of historical, existing, and future sounds of Hamilton and London. In a society that is in a constant state of rapid change, this piece aims to collect and preserve city sounds before they are lost to history. 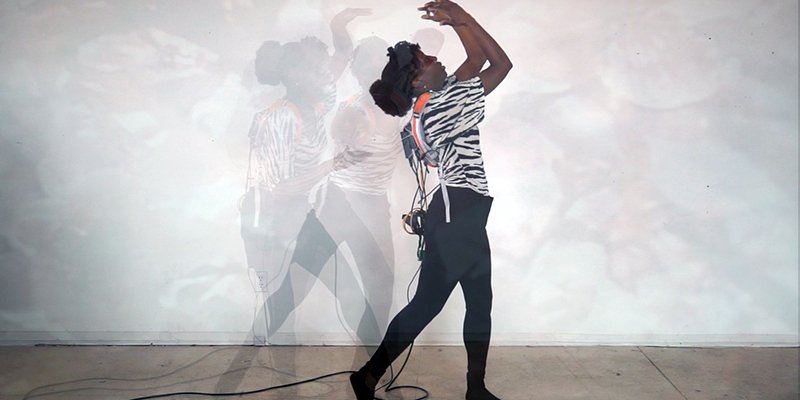 The multi-sensory work invites spectators to engage either through sound, audio description, visual interpretation and/or vibrations while facing a video projection of Jenelle Rouse, a Deaf dancer whose practice responds, interprets and composes movement. In this work, Rouse offers us an embodied reflection and translation; an experiential and corporeal response to the local and digital soundscapes. Her dance embodies a symbolic intersection of the two cities as she streams the vibrations through her movements. Transmitting the speculative soundscape through dance, the two cities converge in a sentiment of live streaming, and digitization. Hear Feel See What! challenges the conventional ways in which we engage with and experience the arts and encourages us to question our notions about accessibility in both art making and presentation. David Bobier, who identifies as having a hearing disability, and Leslie Putnam are from the o’honey collective. Their collective explores the relationship in which humans either oppose or connect with their natural environment. They take iconic elements from the natural world and place them within the realm of human experience and transversely place human constructions within the natural world. The two artists work toward community engagement and the exploration of the intersection between the human and natural world, attempting to bridge the gap between what people know as the truth of their natural world, and the way we have come to experience it through our own constructed realities. Jenelle Rouse lives an exciting life juggling between various roles. While working as a classroom teacher at a Provincial School for the Deaf for almost 10 years and working towards a doctorate in the Education field of Applied Linguistics, Rouse works as a part-time evolving dancer. She is a self-taught deaf artist with a desire to express thoughts and emotions through body movements and dance. Lindsay Fisher is a visual artist and curator, disability arts advocate, and identifies as being a deaf artist. Fisher’s practice critically examines cultural understandings of disability, accessibility, and disability arts as an interventionist tactic to be used to make the city more inhabitable to people living with difference. Michael Rinaldi is an actor/sound designer/writer living in Hamilton Ontario. He has been fortunate to have collaborated with some of Canada’s most exciting theatre companies: Tarragon, Factory, GCTC, Blyth Festival, Common Boots/Theatre Columbus, Theatre Calgary, Vancouver Playhouse, The Arts Club, Electric Company Theatre, Old Trout Puppet Workshop, and many more. He has been nominated for multiple awards in acting, collective creation, and sound design, most recently the 2017 Dora’s for Outstanding Sound design, and the OAC’s 2017 Pauline McGibbon Award for Emerging Designer. TJ Charlton is an interdisciplinary artist, musician, arts educator and archivist currently based in Hamilton, ON.